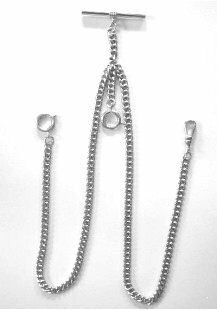 Here is a great quality double albert pocket watch chain. It is solid Sterling silver and has a t-bar on one end that you may pass through a button hole on a vest or shirt. The other end has a pocket watch swivel clasp to securely hold your best white gold or silver watch. There is a fob drop to display your favorite watch fob. Great gift idea for any pocket watch lover!